A. E. Knoch devoted a lifetime to the development of a concordant (meaning harmonious and linguistically consistent) Bible translation of the Sacred Scriptures. His goal was to produce a Bible that was as accurate and literal as the constraints of idiom and good diction would permit. The Concordant Version uses a method of translation that takes into account the superhuman perfection of the scriptural writings, even to the minutest detail (Matt.5:18). Though the Concordant Version includes many technical features, ones which can be of great value to the advanced student, its greatest benefit is to the ordinary reader. It is intended to be read, carefully and thoughtfully, whether in devotional reading or study. The “Bible,” as we have it, and the “Scriptures,” as it exists in the original tongues, are often quite different. It is wise to remember this. Use “Bible” and "Bible Scriptures" for the translations and preserve “Scriptures” for its sacred use to indicate the inspired originals. We are interested in the Bible only so far as it agrees with the Scriptures. The Concordant Version strives to agree at all times. As for the terms “Old Testament” and “New Testament”, these are customary designations to help readers divide the Scriptures into two segments. They are man-made designations that apply to the Bible. “Sacred Scriptures” is an ideal name. It is comprehensive enough to include all. It is exclusive of all else, for no other writings are sacred. In English we have the special term “Scriptures,” which carries in itself the sense of sacred, therefore we are well in line with God when we use the term “scriptures” (Matt.22:29; Mark 12:24; Luke 24:32; John 5:39; Acts 18:28; 2 Peter 3:16). 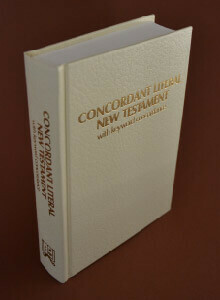 The Concordant Literal New Testament is comprised of the New Testament books, Matthew-Revelation. We provide this work free in two formats: view online, and download. The printed edition is a wonderful gift. Enjoy our consistently translated Scripture. If you want a more in-depth understanding, use our special typographic features. There is a frequent interchange between boldface and lightface words, besides many special symbols and superior characters. These features are explained in the Introduction. 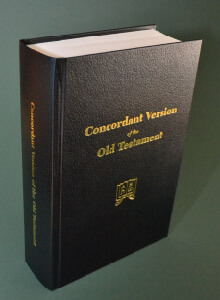 The Concordant Version of the Old Testament is a massive volume of 1,730 pages, printed on Bible paper. The high quality and durable binding provides for many years of enjoyment. The work is comprised of the Old Testament Scripture books, Genesis-Malachi. We provide this work free as a download. This Vocabulary Index is an attempt to provide users of the Concordant Version of the Old Testament (CVOT) access to full listings of the occurrences of each major Hebrew or Aramaic (Chaldee) word (except most proper names) used in the Old Testament. It is admittedly more complex and less convenient than the Keyword Concordance published with the Concordant Literal New Testament. But until such a concordance using the vocabulary of the CVOT can be made available online this may serve as a useful substitute. This is an abridgment of a full list of the English terms used in the CVOT. The list is keyed to Englishman’s Hebrew and Chaldee Concordance (EHCC, 5th edition), which is presently available under the title, Englishman’s Hebrew Concordance (Hendrickson Publishers, Peabody MA 01961-3473, ISBN 0- 913573-21-3). The word entries in this latter edition are coded to the numbering system of Strong’s Exhaustive Concordance. These numbers are also provided here in our index. Because of differences in idiom between languages, a “word-for-word” translation is impractical if not impossible. What is needed, then, is a version that is translated in such a way so as to be concordant (substantively accurate, thus true to the original), yet readable in itself as a literary work. For the discernment of truth, there simply is no substitute for a spirit of wisdom and revelation in the realization of God, that the eyes of our heart might be enlightened (Eph.1:15-19). Definitive context alone determines meaning. We have a definitive context when, with respect to the meaning of a word in question, a certain idea alone truly satisfies such a context. We have the evidence of a word’s true meaning–and therefore of the meaning that truly satisfies such a definitive context–when that same meaning also fits all the occurrences in which the word appears. Let us earnestly seek the truth, endeavoring by God’s grace to become competent workers in His Word. Faithfulness is developed through our own efforts; yet it is achieved solely by and in God’s grace (1 Cor.4:7; 15:10; cf John 3:27). The Word of God is revealed by means of words. If the words we use to translate the Word conceal rather than reveal, then the thoughts of God cannot be known or acted upon. God’s Word, which transforms by renewing the mind and motivates all truly meaningful activity, is laid down for us in a pattern of sound words. Any Version should reproduce the Original, not reflect the religious social environment or beliefs of the translator. The reader has the right to know what God says, exactly, accurately, literally. When our method is understood and applied, it will be applauded. The Concordant principles of translation seek to attain this goal: the sinner’s conviction and conversion, the believer’s solace and edification, as well as Christ’s honor and the glorification of God. GOD has given mankind a written record of His words and ways, His purpose and plans. It is the supreme privilege and imperative duty of all who love God to become closely acquainted with His revelation, to support and promote every effort which seeks to make it manifest, and especially any undertaking which brings God’s Word direct to the common people so that they may come into close contact with God’s written words without the mediation of priest or preacher, church or creed. It is one of the finest and most fruitful works in the world to bring God’s great gift nearer to people in its original purity, preciousness, and power. Then, to make access to His word as easy and practicable as possible. The turning of the Sacred Scriptures into languages other than those in which they were written has been done in a variety of ways. It can be according to their literal adherence to the text, sublinears or interlinears, literal translations, translations, and versions. Each one has its advantages and shortcomings. The Concordant Version seeks to be of the greatest service by giving both extremes, a detailed sublinear and an idiomatic version, supplemented by a concordance. A version is a matter of judgment, rather than exactitude. In this it is in contrast to a sublinear, in which the order of the words, their form, and their composition are kept as closely as possible to the Greek. This should be retained in a version only to a degree compatible with intelligible, fluent English. To trace the story of the Sacred Scriptures from the days when the first inspired autographs were made by godly men, divinely chosen for the work, down through the stormy vicissitudes of the centuries, to this era in which we enjoy them in the English language printed and bound in handy book form, is a story without a parallel in the whole range of sacred or secular history. In the scope of this article, we deal with versions and translations. Through the many streams—Hebrew, Chaldee, Greek, Syriac, Latin, Anglo­Saxon—the Sacred Word has flowed increasingly onward. A complete key to the Greek Scriptures and their English translations in the Concordant Version. This work gives the etymological analysis and idiomatic meaning of every Greek word used in divine revelation. These are confirmed by a complete concordance of every important grammatical form occurring in the three most ancient manuscripts, Sinaiticus, Vaticanus, Alexandrinus, as well as the Concordant Greek Text, the sublinear, and the version. The Greek Elements is designed to complement the Concordant Literal New Testament, the Concordant Greek Text, and the Keyword Concordance. This work consists of tables of the grammatical forms and their English standards, with a reverse index, a complete analysis of the Greek vocabulary with English equivalents, and a short Greek course. It is designed to be used with the Concordant Literal New Testament and its Keyword Concordance, even as The Greek Elements. It consists of a Greek text restored from the uncial manuscripts Sinaiticus, Vaticanus, Alexandrinus, including the annotations of their ancient editors. In its superlinear, it includes all the variant readings of these texts; below its own primary Greek text, it provides an ultra-literal, non-idiomatic English-equivalent text. This work is intended primarily, if not exclusively, for those who wish to study the New Testament’s own Greek text itself. This volume consists of 735 pages. In addition to this printed volume, the Concordant Greek Text, we also offer the document Greek Text and Concordant sublinear, which also includes the Concordant Literal New Testament text.